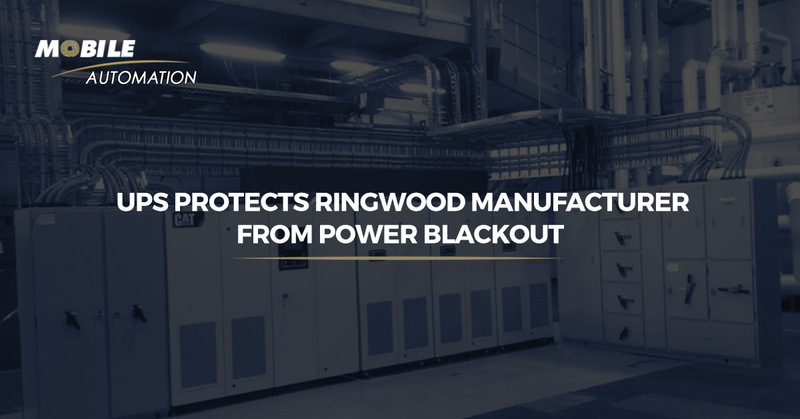 Mobile Electrics was recently approached by a leading chocolate and confectionary manufacturer in Ringwood, Victoria, to design and install an uninterruptible power supply (UPS) at their operating plant. This was to address problems of power spikes or flickers transmitted through the plant from their street supply, often causing their computer controlled equipment in the factory to fail, meaning that a restart of the production lines taking hours, which of course means huge product losses as well as major hits to the bottom line. Instead of a huge bank of batteries, this UPS uses kinetic energy generated via 3 flywheels running continually, which can generate 250kVa each, a total of 750kVA, that provide emergency power for approximately 15 seconds if the main power source flickers or fails momentarily, thus enabling the protected production lines to continue to run unhindered. Due to the size of the client’s facility Mobile Electrics engineers determined that a 750 kVA UPS would be required to protect the equipment. After the design was completed and approved by the site engineers, Mobile Electrics were given the all clear to commence the assembly of the UPS system. The process consisted of installing a 1600amp circuit breaker to the existing main switchboard, installation of a new UPS distribution boards and rerouting of the sub circuits to the UPS. All of the changeover cabling work was completed after hours to fit in with manufacturing demands. 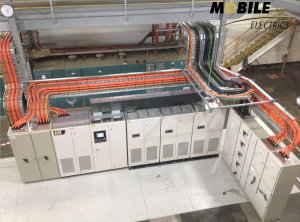 Mobile Electrics assisted in the commissioning process, ensuring that everything was completed to a high standard expected by this high profile client. 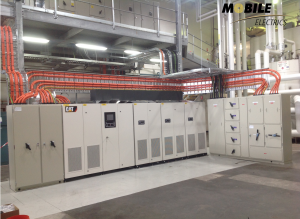 Mobile Electrics completed the installation on time and within budget. The system installed by Mobile Electrics uses the latest technology in UPS equipment, ensuring that the plant will not have to worry about power outages for the future. The UPS is now fully operation and protecting the company’s assets and profits.